Similar to the Trails effect, but the current frame is composited over the previous frames using a Matte input, to give a variety of 'time trails' effects. The output of each processed frame is stored and then combined with the next frame. 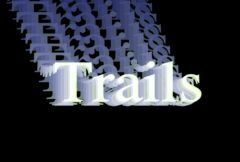 The trails are reinitialized whenever any non-consecutive frame is processed, either the first frame, reprocessing a given frame, or jumping to another frame. You must process multiple frames of a clip in a row to observe the effect. Matte: The opacity values for the Source clip. Areas of the new Source frames are composited over the previous frames where this Matte input is white. Fade: Default: 0.8, Range: 0 or greater, Shared . Scales the brightness of all frames. Enable this for a better composite if the Foreground pixel values have been pre-multiplied by the Matte pixel values. This is also known as an 'additive' composite. Fade Color: Default rgb: [1 1 1], Shared . For each frame, the previous output is scaled by this color before it is combined with the new input frame. This is similar to Fade but affects the colors of the previous frames instead of just the brightness. Color: Default rgb: [1 1 1], Shared . Scales the color of all frames. Set this color to the complement of Fade Color to offset overly colored trails. Output Matte: Check-box, Default: off, Shared . If enabled, the processed Matte channel is output instead of the regular output, for potential use in future composites onto other backgrounds.